If you did not know Arctic hurricanes happen, you are not alone. They even come with a central "eye", extreme low barometric pressure and towering 30-foot waves that can sink ships and cover metal platforms with thick ice, threatening oil and gas exploration. Climate scientists report the first conclusive evidence that Arctic hurricanes, also known as polar lows, play a significant role in driving ocean water circulation and climate. Their results point to potentially cooler conditions in Europe and North America in the 21st century than other models predict. 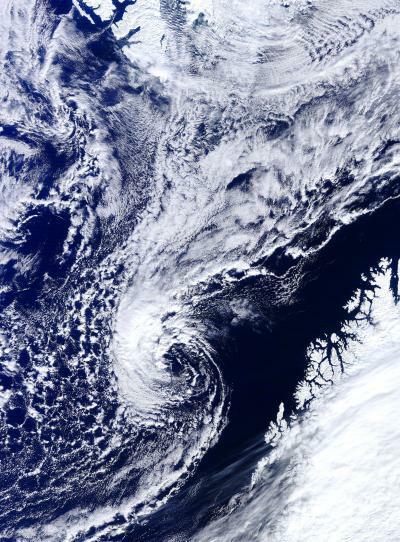 Geoscientists Alan Condron at the University of Massachusetts Amherst and Ian Renfrew at the University of East Anglia write that every year thousands of these strong cyclones or polar lows occur over Arctic regions in the North Atlantic, but none are simulated by the latest climate prediction models, which makes it difficult to reliably forecast climate change in Europe and North America over the next couple of decades. "Before polar lows were first seen by satellites, sailors frequently returned from the Arctic seas with stories of encounters with fierce storms that seemed to appear out of nowhere," says Condron. "Because of their small size, these storms were often missing from their weather charts, but they are still capable of producing hurricane-force winds and waves over 11 meters high (36 feet)." To understand the importance of these storms on climate, they simulated the high wind speeds associated with these "missing" storms. "By using higher resolution modeling we can more accurately simulate the high wind speeds and influence of polar lows on the ocean," Condron says. "The lower-resolution models currently used to make climate predictions very much miss the level of detail required to accurately simulate these storms." They found that by removing heat from the ocean, polar lows influence the sinking of the very dense cold water in the North Atlantic that drives the large-scale ocean circulation or 'conveyer belt' that is known as the thermohaline circulation. It transports heat to Europe and North America. "By simulating polar lows, we find that the area of the ocean that becomes denser and sinks each year increases and causes the amount of heat being transported towards Europe to intensify," Condron points out. "The fact that climate models are not simulating these storms is a real problem, because these models will wrongly predict how much heat is being moving northward towards the poles. This will make it very difficult to reliably predict how the climate of Europe and North America will change in the near future." Condron also notes that other research groups have found that the number of polar lows might decrease in the next 20 to 50 years. "If this is true, we could expect to see an accompanying weakening of the thermohaline circulation that might be able to offset some of the warming predicted for Europe and North America in the near future."